A little less than a year ago, we called upon QE readers and fellow cult film fans to consider supporting Erick Solis' 80's throwback actioner Night Run. 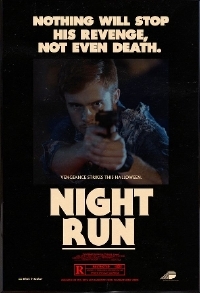 Playing like a supernatural Death Wish, Night Run is a revenge tale about a murdered boyfriend who rises from the grave to avenge his death and the death of his once bright future. Well, you rose to the occasion and the film was successfully funded and now we have a bit of an update in the form of a teaser that signals the film has finished shooting and entered post production. The teaser below showcases some striking photography and a killer synth score by Crockett. Well known in the synth scene, Crockett has composed dozens of tracks emulating film scores from the 80's with an unique synth sound that encapsulates sounds and emotions from action and teen romance films from that era, replicating the sound like no other musician. Loving the vibe here.